The son of a Labour Party councilor was one of nine Britons arrested in Turkey for allegedly trying to enter Syria. Shakil Ahmed said he was ‘shocked and extremely upset’ upon finding out his 21 year-old son was being held by Turkish authorities. Waheed Ahmed was arrested by Turkish authorities at Reyhanli, in Hatay province, near the Syrian border on Wednesday. He was one of nine family members, which included four children, who are alleged to have been trying to cross into Syrian territory. His father, Shakil Ahmed, who is a Labour Party councilor from Rochdale, near Manchester, said in a statement that he wants his son to come home as soon as possible. "He's studying a degree in politics and sociology at Manchester University and has a good future ahead of him." Waheed Ahmed could be seen laughing as he was escorted by Turkish police officers and asking television reporters if they wanted an interview. The group, which included four adults in their early 20’s as well as a 47 year-old and four children, aged one, three, eight and 11 are all believed to be from Rochdale and will be deported from Turkey on Thursday. Assistant Chief Constable Ian Wiggett of Manchester Police said, "What is obviously concerning is why a family were seemingly attempting to take very young and vulnerable children into a warzone. Such a volatile and dangerous environment is no place for them whatsoever. "We have commenced an investigation to try and establish their reasons for travel and as this is a live investigation - which is very much in its infancy - we are not in a position to comment further." The arrest of the nine family members on the Turkish/Syrian border came on the same day that a British teenager who had joined up with the Islamic State to work as a medic, made a plea to her family that she wanted to return to the UK. Lena Mamoun Abdelgadir, a 19 year-old student, who grew up in the English county of Norfolk, wanted to quit the militant organization according to a Turkish politician. “A female student, 19-year-old Lena, sent a message to her family saying she wanted to go back. We will try tomorrow to bring her and those who are with her back,” opposition CHP politician Mehmet Ali Ediboglu told Reuters. Turkey has been criticized by Britain in the past for its lax border security, which allows Islamic State (IS, formerly known as ISIS/ISIL) supporters to join up with the jihadist group with relative ease. In February, three London schoolgirls aged between 15 and 16, traveled to Syria via Turkey with the intention of becoming IS jihadi brides. Poor communication between the British and Turkish authorities was cited. 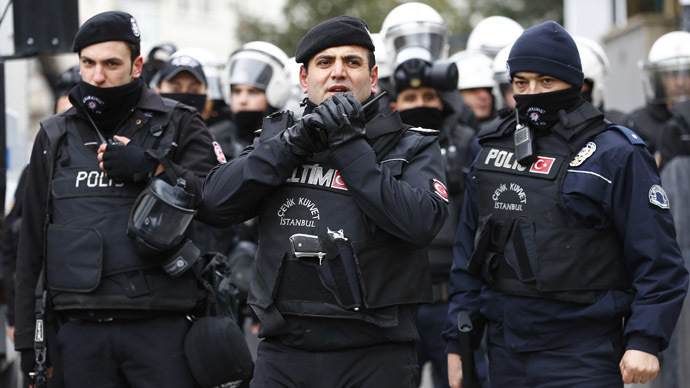 London’s Metropolitan Police said it had informed Istanbul within 24 hours, but the Turkish Gendarmerie alleged it received no details for three days.